While yesterday's story about The Heidelberg Project is interesting on its own, we have to confess to setting that one up first so we could follow with this one as a chaser. Tyree Guyton created an interesting and original installation art neighborhood out of found objects and weirdness. "The Heidelberg" here is a far, far more expensive and hideous endeavor. 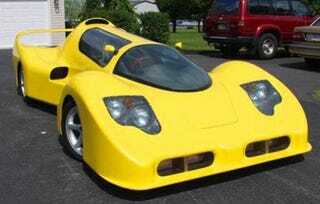 Rumored to be the result of a side project at a defunct aerospace company, the costs associated with this (thankfully) one-off car will make you do a spit-take. So, What Is the Heidelberg Project?